Bakaliaros me Stafida... Cod with Raisins. Bakaliaros me Stafida... Cod with Raisins. A specialthy of the coastal city of Kalamata. 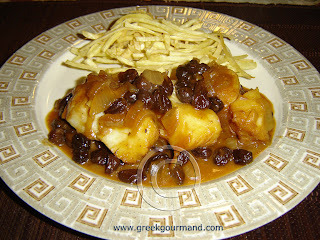 This dish consists of the rather unusual combination of cod and raisins and is a specialty of the Greek coastal city of Kalamata in the Southern Peloponnese. This dish is quite easy to make and is an excellent mid-week, comfort meal. 1. If you're using salted cod, make sure to soak the cod in water for at least 24 hours, ensuring to change the water several times, to remove the salt. 2. Heat olive oil in a cooking pot over medium heat, add chopped (not too finely) onions and sautee lightly for a few minutes; make sure to stir constantly to avoid browning the onion, we want it tender but not burnt. 3. Dilute tomato paste in 3/4 cup of water and add to onions, bring to boil and simmer for 10 minutes. 4. Add raisins to pot and continue to cook for a couple minutes, then add 8 oz. (1 glass) of water and bring to boil then simmer for approx. 1/2 hour until the raisins have expanded/puffed up. 5. Add cod to pot and leave to simmer for 15 minutes until the sauce has reduced, then serve fish with raisin-onion sauce spooned overtop. The above quantities result in two (generous) servings, simply double quantities to feed 4. For a side, try thinly sliced parsnip fries (fried in oilve oil). A good accompaniment would be a mixed green salad with your choice of dressing.